From what I’ve heard, trailer trash are often “stewed”. The sauce is rather pungent. He prefers to be called “Stewart of unclaimed resources”. Don’t throw away food, just save it for the trash. You want take-out? Take out your own trash! 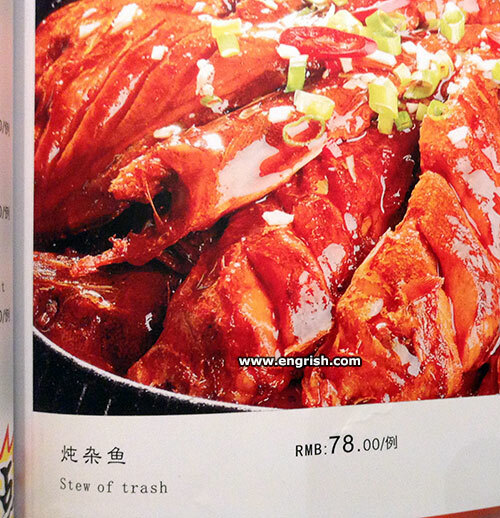 One man’s trash is another man’s stew. Come to think of it, this is not Engrish, this is the raw reality of many places I have eaten. The first word should be “spew”. What used to be known as mulligan stew. Looks better than the menu at KFC and Mac. Does it resemble anyone you know? @Marum 8:33am : The Kardashians?! @BFC 1022.. I hope you don’t mean, “know” in the biblical sense.